Here you can configure the appearance of the tabs added to your applications by TidyTabs. To access this screen, double-click on the tray icon, at the bottom-right corner of the screen, and click on APPEARANCE. None: all the tabs are white. Use a custom color: all the tabs are drawn with the same user defined color. 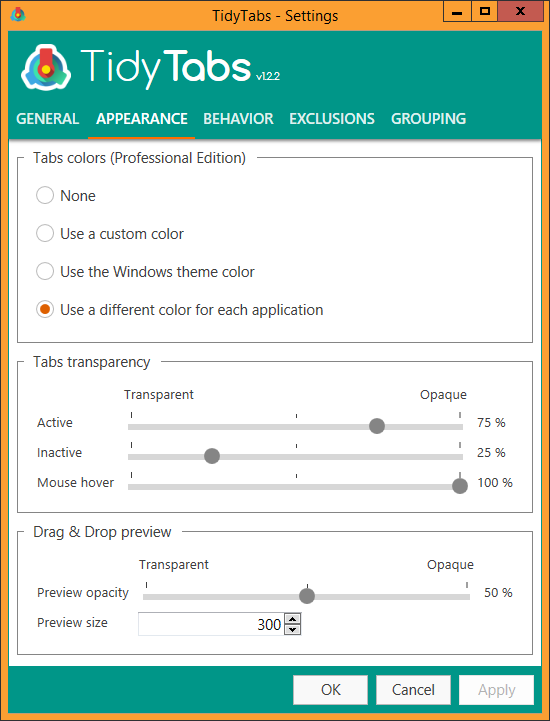 Use the Windows theme color: TidyTabs uses the color used by Windows to draw window borders. Use a different color for each application: TidyTabs affects a different color for each application. The color is based on the dominant color of the application icon. Tabs transparency: this setting allows you to adjust the transparency of the tabs in different situations. By default, the tabs are configured to stay semi-transparent until use them, in order to reduce the visual noise. Active: set the opacity of the tab group attached to the foreground window. The default value is 75%. Inactive: set the opacity of the tab groups attached to inactive windows. The default value is 25%. Mouse hover: set the opacity of the tab group under the mouse cursor. The default value is 100%. Drag & Drop preview: this settings allows you to configure the appearance of the small preview image following the mouse cursor when you drag a tab from one group to another. Preview opacity: set the opacity of the preview image. The default value is 50%. Preview size: set the size in pixels of the preview image. The default value is 300.